Archery biathlon(or ski-archery, as it is named under authority of the official international archery federation � FITA) has an unusual and interesting history. Pre-historic man recorded his use of skis, bows and arrows while hunting, in cave drawings and in pictographs. Early man had a need to travel over the snow with his weapons in pursuit of game or in defense of life and/or territory. His very survival was dependant upon these combined skills. A poor skier or poor archer, literally, could not survive in the unforgiving conditions that existed. A combination of the two skills was essential. In more recent history and folklore, various cultures have added to the archery biathlon mystique. Notable among these are the Norwegian Birkiebeiner, or "birch leg" warriors, who skied the now famous 55 kilometer route with bows and arrows on their backs to rescue their Royal Prince, who had been kidnapped, in the year 1206. The rather imposing figure of the Birkiebeiner was selected as the mascot for the 1994 Winter Olympic Games in Lillehammer, Norway. Uller (Ullr), the Northern God of Winter, was the son of Sif and the stepson of Thor, the "God of Thunder" and possessor of the "Sacred Hammer." Uller was so accomplished an archer and so proficient on skis that no one was able to match him in either target competitions or ski races. It has been said that Uller enjoyed the cold weather and loved travelling throughout the land, gliding along on his great skis, for pleasure and while hunting. Modern archery biathlon, often refered to as "Ski-Arc" or as �Ski-archery�, is a blend of cross-country skiing and target archery combined into a single exciting and enjoyable event for athletes of all ages. Interest in the sport is growing rapidly in North America and in Asia(especially in Japan) and in Europe, where it is already well established. A typical event includes a 6 to 12-kilometer ski course with two to four stops (ends) at the targets. Ends alternate between kneeling(k) and standing(s) positions. A simple plant of "hit-or-miss" style targets(diameter 16 cm) is used at an 18-meter distance from the racers. Therefore the arrows must have hemispherical points that just hit but not remain in the target. When releasing, the arrow reaches a speed of approximately 180 km/h. The weight that the archer is holding with a hand when the string is completely hold back, called draw weight, must not exceed 35 lbs (lbs = English pounds, corresponds to approximately 450 grammes per pound, so totally not more than 15.75 kg). Every shooting unit consists of 4 arrows for 4 targets except relay competitions where only one extra arrow per athlete per each shooting is allowed. Archery biathletes carry their bows and arrows themselves on the back while skiing the course either with the help of specially-designed backpacks(harnesses) or with the help of biathlon straps and container of the arrows attached directly to the bow. Skis are not removed for shooting. As in a rifle biathlon event, scoring is a combination of ski time and shooting points scored. Shooting mistakes are followed after the complete shooting unit by penalty loops of 150 m. In the individual competition only shooting mistakes are imposed without penalty loop running, but added to the final time with one penalty minute per target not hit. Various Ski- and Archery-Associations had already organised games in the combination of Archery and Cross-country Skiing times ago. The real competitions have begun in Italy since 1981: first there were some regional events, then Italian Championships, later on competitions between Italy and France. 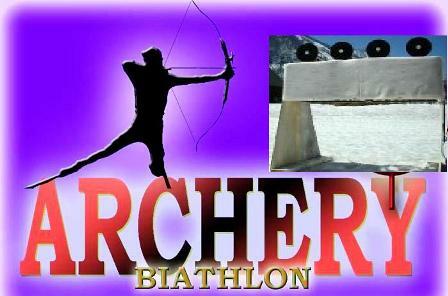 And from 1991 ski-archery became an official kind of sport(was recognized by international archery federation � FITA). But only in 1996, it reached wider popularity when the Italian Archery Federation(FITARCO) organized an official conference on Archery Biathlon in Val Senales. This amazing sport was presented to the invited nations from all over the world and so the Italians made the first step to increase the interest in Archery Biathlon on the Europeans and including the global level. First international event was organized in Nagano(at Olympic sports facilities) as a demonstration competition to pay an attention of International Olympic Committee(IOC) to be eventually included this kind of sport into Olympic family. Therefore it was possible to organize the first World Championship with 12 participating nations already in 1998 in Cogne(Italy). The second World Championship in Bessans(France), taking place only one year later, was a really significant point because the 13 participating nations did come from all over the world: they came from the USA and Canada, from Belgium, Germany, Austria, Switzerland, Italy, France, Slovenia, Poland, Russia, Norway and even Japan. Archery Biathlon is up to leave its childhood, as shown by the introduction of whole competition series with a ranking on complete season results. The first European Cup took place in season 1999/2000 and was crowned by the European Championship 2000 in Pokljuka. There was no difficulty to recognize it as the level of performance has obviously increased. Archery Biathlon is getting more and more a real combi-discipline, where athletes have to master both of the disciplines in an excellent way. The season 2000/2001 can be seen as the greatest Archery Biathlon event year so long, because, additionally to European Cup and European Championship it contained the third World Championship in Kubalonka (Poland). With each year each conducted world championship indicates a further step towards the invitation to Olympia. Yes, bringing Archery Biathlon to the Olympic Games is considered the great vision of the people involved in this fascinating and amazing discipline. As its birthplace was Italy, a much-longed-for dream would be fulfilled with an Archery Biathlon demonstration at the Olympic Games of Torino in 2006. But due to bureaucratic red-tape demonstration had been cancelled. Today the sport is governed by a partnership of the International Biathlon Union (IBU, which was responsible for this kind from 2002 until 2005) and Federation Internationale de Tir a l�Arc (FITA). It is popular in Italy, France, USA, Germany, Ukraine, Slovenia, Russia and Japan. As of the winter season 2006, FITA has become the international governing body for Ski Archery. International events (World and Europe Championships) are being organized. In Russia archery-biathlon is more fully developed in 15 regions, every season national championships and Russia�s cup stages are organized. For further popularization of archery-biathlon FITA together with International Olympic Committee(IOC) will do everything to be this kind of sport an Olympic (in 2014 owning to realization of Olympiad in Russia it will be an excellent chance to go into �Olympic sports family�). The archery-biathlon competitions showed very big attraction, spectacularity, dynamicness and eventually might be very attractive/interesting for mass-media and TV-broadcasting.